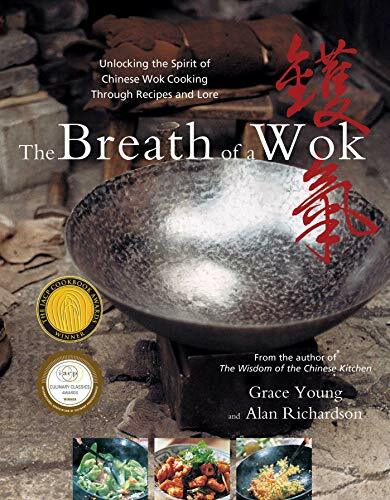 Recently I acquired a beautfiul new cookbook, The Breath of a Wok by Grace Young and Alan Richardson. Its gorgeous photography and innovative-yet-familiar recipes are supplemented by several chapters about the history of woks, Chinese wok culture, purchasing a wok, seasoning a wok, what woks are made of, and, most importantly, a concept in Chinese cooking called wok hay (or wok hei; it's the phonetic translation of the Northern Chinese pronunciation of the word that means chi, or life-energy). When food is cooked in a very hot, well-seasoned wok, the wok imparts a texture and flavor to the food that lingers for only minutes after preparation. This is wok hay. Since reading The Breath of a Wok (cover to cover, as I usually nerdily read cookbooks), I have been obsessed with acquiring a wok and acheiving wok hay on my own. Woks are either made of cast iron or carbon steel (each preferred in a different part of China). Cast iron woks are thick and heavy. This makes them very sturdy and resilient; they also get very hot and stay hot for a long time after removed from heat. However, the weight makes them harder for an unpracticed novice with no upper-body strength like myself to maneuver, particularly when tossing the contents of the wok (called pao - I will learn to do this). Carbon steel woks are lighter because the metal is beaten very thin; this makes them easy to handle but also more fragile (i.e., a carbon steel wok will shatter if it gets smacked against a counter or dropped). They also don't retain heat as well; in a Chinese fire pit or wok stove this is less relevant because of the extrememly high temperatures, but on a western gas stove, heat retention becomes paramount. To flat-bottom or not? I, of course, am enamoured with the idea of having a wok that's just like the ones the Chinese were using two thousand years ago - a wok with a rounded bottom. Unfortunately, not only do they fail to perch steadily on a western stove, they don't absorb heat as evenly or efficiently as a flat-bottomed wok. Handles: Northern Chinese woks typically have a long handle, excellent for pao; Southern Chinese woks have two steel grips on either side of the wok, which require less strength but more caution (you can easily burn your hands!). The most recent innovation is a long pao handle on one side and a grip on the other. Also, ought there be wood or rubber coating on the handles? On the one hand, they make the wok infinitely easier to...well...handle (and you don't have to deal with potholders); on the other, handle coverings rule out the possiblity of seasoning your wok in the oven. Size: woks come in many sizes, from a foot across to more than three. The average American gas stove can accomodate a 17-inch wok or smaller. As it happened, my Chinatown adventure became moot: I was walking to rehearsal for my show that's running right now, and I passed a pile of stuff on the street that looked like apartment discards...and right on top was a wok. Two moving men stumbled out a nearby doorway and contributed a bookshelf to the pile; a girl leaned out an upstairs window and explained that she was moving and I could have whatever I wanted. If this strikes you as a little ghetto...you've obviously never lived in Lower Manhattan. Everybody furnishes their apartments from sidewalk finds; it's common practice. And hello, it's recycling! I took the wok. It was cast-iron with a long wooden pao handle, and though somewhat used and a little sticky (a la cat hair), it was in decent shape, not rusty at all. No patina had been developed, which meant that the girl probably didn't know that you're not supposed to wash a wok with soap and water after using. I bought some steel wool on the way home and gave it a good scrubbing, inside and out. I washed it throughly with hot water and detergent for perhaps the last time in its wok life. Then I gave it its first ceremonial seasoning by rubbing the inside of the wok with chives (to get rid of the metal taste) and frying pork fat in it. According to Breath of a Wok, a new wok has to be throughly seasoned before cooking foods that might stick. I, therefore, have been seasoning my wok by swirling cold oil in the hot wok every couple of days and stir-frying simple combinations of onions, garlic and ginger. To clean the wok, I just pour off the excess oil, swirl a little water in the wok with a wok brush, and dry it by heating it up again over a high flame. Which all brings me to my first real use of the wok; my first attempt at wok hay. It was a very simple saute; I didn't want to disrupt the newly-forming patina on my gleaming wok. I heated the pan, swirled a little peanut oil and sesame oil up the sides of it. I squeezed in a splash of giner juice, a pinch of red pepper. 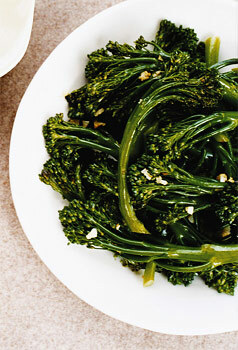 I tossed in a crisp, brilliant green handful of broccolini. The wok hissed and sizzled wonderfully. I pao-ed with finesse, tossing my broccolini gently in the air. after about thirty seconds, I added in a splash of soy sauce, which turned instantly to fragrant steam and billowed above the wok. Another thirty seconds passed, the broccolini glowed green, and I scooped it into a bowl. Hurriedly I swished water in the hot wok, anxious to try my broccolini...to see if I had done it...steam rose off the bowl; the glistening stalk trembled in my chopsticks. I crunched down. I did it. I DID IT! WOK HAY! The brocollini was hot and crunchy, the perfect texture; all the flavors my wok had absorbed shone through (there's the pork fat! And the garlic! And the chives!). I couldn't wait to eat the rest of it before the wok hay went away AND THEN THE BUZZER RANG!!! AAAAAAAHHH NOOOOOOOO NOT THE UPS GUY!!!! ...but the wok hay was gone. I didn't think it was possible to get wok chi in a standard American home kitchen and wok! I barely encounter it in restaurant wok-cooked food. So yay for you that you got it right! When I come to NY can we go sidewalk shopping...I need one of those woks! I remember many years back when wok cooking was very popular and I did it a couple times a week (never even trying to reach wok hay, mind you, just stir frying)...after reading your blog, I don't know why I stopped! thats good.....brthday ? 28/4 ? My mom took a Chinese cooking course and we have a large wok (not sure of the exact size, though bigger than yours I imagine) with a completely round bottom. If and when you have a stove big enough to switch over to this sort of thing, know that the completely round bottom CAN work on the Western stove. My mom's has a metal ring which you put around the flame, and the wok is placed inside the ring and you can move it back and forth. Except with a wooden handle. The wok also has wooden handles. She produces some really excellent stuff with it, so I'm glad you're having similar fun and success! How cool! I have never had a comfortable relationship with Chinese food...I consider it to be one of the few cuisines I would rather buy than make. But this makes me want to learn to do better! chuckle....first time a blogger with the same birth date as I ....Happy Taurean to u..
What a great post! 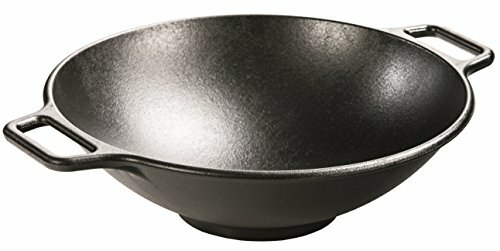 I'm on the verge of inheriting a wok from my mother, but didn't know about the seasoning process. Now I am fully armed with info and will attempt to conjure up some wok hay of my own. Thanks! And a very happy birthday--though now belated. What a fantastic article! I have been searching for an informative article on woks and your post is the best I have come across in days of searching! Can't wait to head into my Chinatown here in Sydney Australia to get a cast-iron wok and follow your steps in seasoning the wok and hopefully churn so yummy stir fries! These woks are great.......except for the part that the paint comes off of the wok and mixes with your food :( But on the other hand, they work good for frying noodles!! I would reccomend that you do not buy the whole set of woks because I did and the paint kept coming off of the wok and into my food!!! 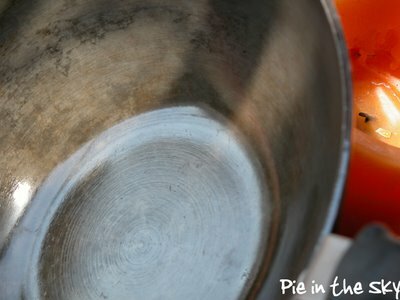 the woks that peel are the teflon and other non-stick coatings. as for the stability of the woks. 1. carbon steel. very good and it is very stable and strong. 2. cast iron (chinese) very light 16" approx 3# (american) most american cast iron woks are about 8-15#. castiron are very brittle (chinese) and the american are very heavy but the chinese version is the best and they are great to use. go to WOKSHOP.COM and buy one from tane chan. she is great and once you have the wok seasoned you will probably never have to season again if you follow her instructions.